Wild street house is located on a corner block in one of Canberra’s more established suburbs, a site that is sheltered from the public realm at pedestrian level by an established hedge at the block boundary. The concept realised is an architecture connected with its surroundings using simple architectural forms sympathetic to the suburb's history and assembled with visual and functional interest to appeal to a wider audience. The design addresses the corner block with 2 welcoming frontages at both streets. Within the site, the house meanders and reaches over the garden containing resort style internal and external living areas where the young family can depart from the fast pace of daily life. The house’s program is resolved over two levels, the ground floor being the public domain, and the upper floor the private family areas. During periods of rest, the family ascends to the first level for quite time in contained spaces that share views of the surrounding tree canopy and sky beyond. In time of entertaining and daily living, the ground floor internal and external spaces are arranged to allow for multiple activities to take place simultaneously and in comfort. 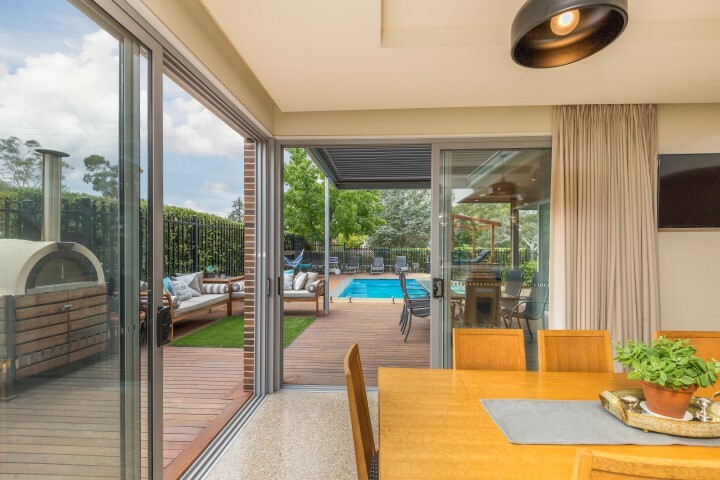 Collaboration with the structural engineer and the owners as builder ensured the design intent was consistent with the brief requirements; to deliver a family home light drenched and connected to its external surroundings and enhancing daily activity. The spatial and material expression compliment the intent of fragmenting the building envelope to create internal and external spaces of varying qualities and provide flexibility to modern family living and entertaining. Wild Street House is a solar passive design with optimal orientation to maximise sun penetration during the winter months. Thermal mass slabs and masonry walls provide passive thermal storage. Double glazing end mechanical external shading allow the owners to better control the internal environment in extreme weather. A pool is located to emphasize the cooling breezes in the warmer months and a cool respite for family and friends. Hot water is delivered using an energy efficient heat pump, and a solar power installation is connected back to the grid.